A Day Understanding Sewing Patterns, experience & learn the language, symbols & technicalities. Sewing Patterns can be confusing. This full day workshop aims to teach you how to choose and use a simple pattern while using one to make a simple item (PJ bottoms). The workshops are designed to be relaxed, enjoyable and informative. We also like to make it easy for people to come by providing all of the materials and use of equipment needed within the cost. All you need to do is come along and sew. The cost is £49 and payment is needed at the time of booking to secure your place. Workshop places are limited to enable sufficient time and attention is given to all. 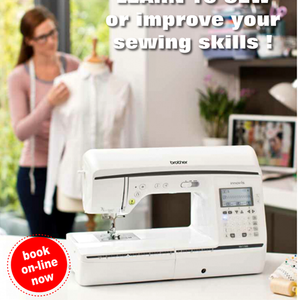 You can book online via https://jaycotts.co.uk/collections/sewing-courses-and-workshops-at-jaycotts. If you would like more information, you are welcome to contact Christi via email: Y2hyaXN0aSB8IGpheWNvdHRzICEgY28gISB1aw==.